Previously, we wrote about the ongoing legal battle between Deutsche SiSi-Werke Betriebs GmbH, owners of the CAPRI SUN® brand, and Faribault Foods over Faribault’s laminated fruit juice pouches. In particular, we wrote about how SiSi-Werke’s registration for its laminated pouch trademark had become incontestable, and what impact such incontestability would have on Faribault’s ability to argue that the CAPRI SUN® brand’s laminated pouch registration was invalid. 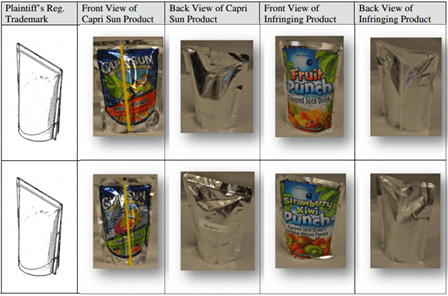 A chart taken from SiSi-Werke’s complaintagainst Faribault Foods comparing CAPRI SUN® brand juice pouches with the allegedly infringing pouches made by Faribault. Upon further review, it appears that one of the exceptions to Section 15 Incontestability may, in fact, apply in the SiSi-Werke / Faribault Foods case: the so called functionality doctrine. For most trademark registrations, functionality is never an issue since words alone are non-functional. Take, for example, SiSi-Werke’s registration for the CAPRI SUN® mark and logo. While helpful in advertising the product, there is nothing “functional” about the words “Capri”, “Sun” or the stylized logo featuring the words “Capri Sun” in a unique font with a scroll underneath bearing the phrase “all natural”. in general terms, a product feature is functional, and cannot serve as a trademark, if it is essential to the use or purpose of the article or if it affects the cost or quality of the article, that is, if exclusive use of the feature would put competitors at a significant non-reputation-related disadvantage. In re Owens-Corning Fiberglas Corporation, the Federal Circuit found that the pink shade of Owens-Corning fiberglass was protectable since it too did not serve any functional purpose. U.S. Patent 3,380,646—a patent filed in 1963 which long since expired such that the utilitarian product features have entered into the public domain. 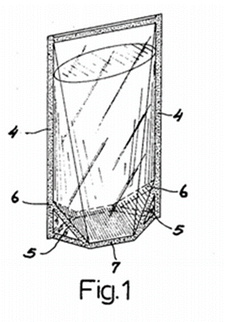 Figure 1 from this 50+ year old invention (at left) shows the pouch design claimed by the ‘646 patent. Since this patent expired and the utilitarian product features it covered passed into the public domain, anyone—whether SiSi-Werke, Faribault Foods or any other company—should be able to reproduce this technology. Were Faribault Foods to raise the functionality doctrine, the court would be called upon to evaluate what elements, if any, of SiSi’s laminated pouch trademark registration (See U.S. Reg. No. 1418517) are “functional” and which are not. To the extent that Faribault Foods or any other company merely duplicates functional elements (e.g., elements claimed in the expired ‘646 patent) the court would likely find either: (i) there is no infringement against SiSi’s trademark registration; or (ii) SiSi’s trademark registration is invalid. This leads to an interesting dichotomy touched upon in our previous article: how best to synergize marketing and intellectual property protection. From a marketing prospective, the numerous functional benefits of using a flexible laminated pouch are a natural selling point. For example, SiSi highlights the advantages of the CAPRI SUN® brand’s flexible laminated pouches such as minimal weight, ability to withstand being dropped and flexibility to allow for freezing directly in the container. While emphasizing the useful-nature of their laminated pouches may be good for sales, it could have a negative impact on the strength of the company’s trademark registration since every “useful” feature will be one more argument that can be raised against SiSi’s trademark registration under the functionality doctrine. One of SiSi’s chief difficulties in this case will be explaining where functionality ends and aesthetics begins. Take, for example, the graphics and color scheme of CAPRI SUN® brand pouches. Traditionally, graphics, color and packaging are non-functional elements. Here, however, a major “design” facet of CAPRI SUN® brand pouches is the mirrored finish on the edges and back of the pouch (shown below in comparison with the allegedly infringing pouches made by Faribault Foods). While SiSi will likely argue that this reflective material is part of the design aesthetic (and thus non-functional and protectable), Faribault will have a strong argument that the reflective material is functional. As SiSi-Werke’s own website illustrates, CAPRI SUN ® brand pouches are made using three layers of materials—an outside layer of polyester, a middle layer of aluminum, and an inside layer of polyethylene. SiSi-Werke’s website further highlights that the aluminum layer (which causes the reflective look of the pouches) “protects the sensitive contents from oxygen and light.” Based largely on such statements, Faribault Foods will likely argue that the chief “design” characteristic of the pouches is, in fact, a functional part of protecting juice from oxygen and light rather than a trademarked design aesthetic. Grimes LLC will continue following this case as it develops, and we encourage you to check back in the coming weeks for new stories about this and other exciting developments in intellectual property law.